This week we feature another track of Feigl Yudin recorded in a 1978 concert presented by the Balkan Arts Center (now Center for Traditional Music and Dance, Ethel Raim provides the introduction). 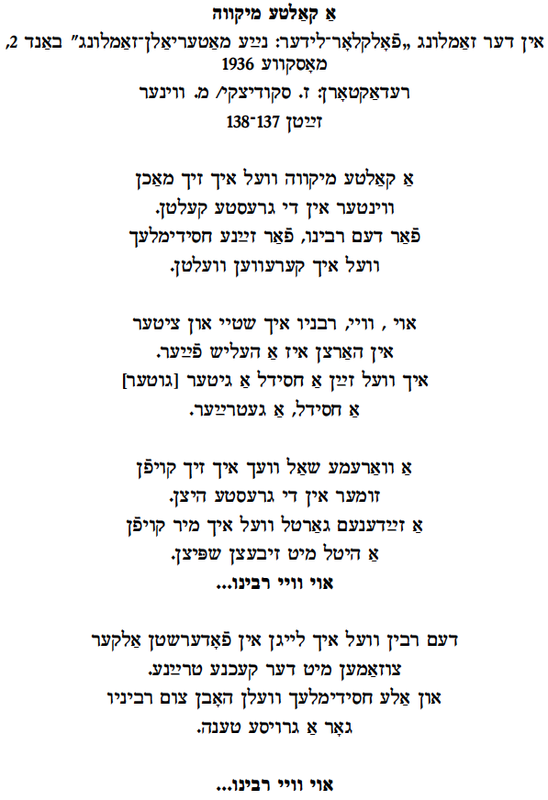 Vi sheyn s’iz itstert di pagode (How beautiful is now the weather) is another lyric love song by Feigl Yudin, this time in the voice of the man. I have yet to find other variants. Today the term “cavalier” sounds old-fashioned, but it is often found in Yiddish folksong to denote suitor, gentleman, boyfriend. The admission that he cannot write is a rare one in Yiddish song, since most males had at least a rudimentary Jewish education and could read and write. Feigl sings “Der ponim” instead of the standard “Dos ponim”, which reflects her Grodno dialect. Es tsit mayn harts mit libe tsu dir. Vayl ikh bin der shenster kavalir. Khaye-Shoshe, di zogst ikh hob a feler. Hob ikh oykh a sredstve tsu dem. Un vel zikh oyslernen shraybn fun dem. vi di shtern shaynen zey. un shtendik shpiglen zikh in zey. un dayne lokn iz tayerer fun gelt. un dayn ponim’z der shenster af der velt. How beautiful is now the weather. With love my heart is drawn to you. Because I am the most handsome cavalier. Khaye-Soshe, you say I have a fault. So I have a remedy for that. and will learn to write from it. like the stars they shine. and always look at my reflection. and your face is the most beautiful in the world. “Yo, yo du vilst” (Yes, yes, you want) is a version of the international ballad, often called “Impossible Tasks”, #2 “Elfin Knight” in the Child ballad canon (Scarborough Fair is another example of this ballad type). Many Yiddish versions have been collected over a wide area of Eastern Europe. Hardly any of them, however, included the music when published. A more popular version was recently printed with music in Yiddish Folksongs From the Ruth Rubin Archive, Wayne St. University Press, 2007, page 61 – 62. Adrienne Cooper recorded that version on her CD “Enchanted”. 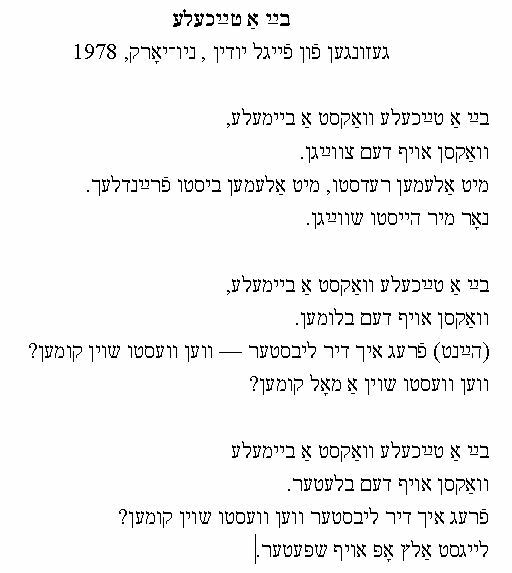 In The Folk Songs of Ashkenaz, edited by Philip Bohlman and Otto Holzapfel, 2007, the compilers compare two Yiddish variants to four German variants on pages 82 – 89, music included. 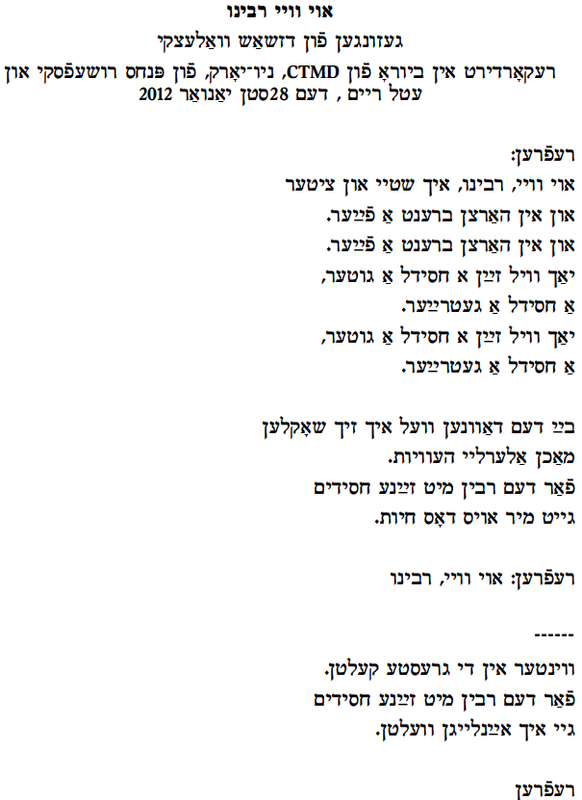 The version sung by Josh Waletzky (which I recorded from him in 2007) parallels several found in Noyekh Prilutski’s Yidishe folkslider volume 2 (1913), pages 96 – 104, seven versions in all, and another one in the supplement at the end, pages 164 – 165. Most of the variants are from the Warsaw area. Waletzky sings only two verses (which he learned from Leyele Klempner, who sings on screen in Waletzky’s documentary film “Image Before My Eyes”) but one can easily reconstruct a fuller Warsaw version of this song. I did so for the Advanced Yiddish Song Workshop this month at Yiddish Summer Weimar in Germany, but more work needs to be done. Ethel Raim played the class this recording; a beautiful melody quite different from the other melodies for this song. az ikh zol mit dir tnoyim shraybn. Yes, yes you want, yes, yes you want. that I should sign the engagement contract with you. Yes, yes you want, yes, yes, you want. as many as are in the sky.